The Jack Hammer is the collaboration between Z Man and Evergreen that since its release has been causing a lot of "chatter" through the circuit. Designed by Elite Series pro's, Brett Hite and Morizo Shimizu, the Z Man Chatterbait Jack Hammer brings a whole new level of tournament caliber quality to the bladed jig game. One of the most highly anticipated vibrating jigs to ever hit the U.S. market, the Jack Hammer takes the already proven features of the Original Chatterbait and not only improves them even more but also adds features yet to be seen. Featuring one of the thinnest blades in the lineup which allows the Jack Hammer to start up with ease and a low center of gravity head aids in it running true at any speed without being prone to the blow out issue found in others at higher speeds. The flat bottom of the head makes this bladed jig the easiest to skip perfect for getting under docks and over hanging limbs. The head design also features a channeled groove which positions the blade low enough to strike the head thereby producing the signature "chattering" sound while also preventing it from dropping out of the eyelet and failing to vibrate. One of the newer features yet to be seen on other Chatterbaits is the premium hand-tied silicone rubber skirts which stay in place fish after fish and skip after skip. Offered in a range of proven colors and providing a lifelike action the quality skirts conceal a double wire keeper, heavy wire Gamakatsu hook that ensures high hook up ratio and securely placed trailers. If you are a bladed jig fan this is sure to become a familiar sight in your boxes and may be the last bladed jig ever wanted. These lures flat out catch fish..... best bladed jig on the market . They are a bit pricey but worth every penny! Nothing about the price of this bait is misleading. It's worth every penny. I caught 40 4+ lb bass in Illinois because of the jackhammer. 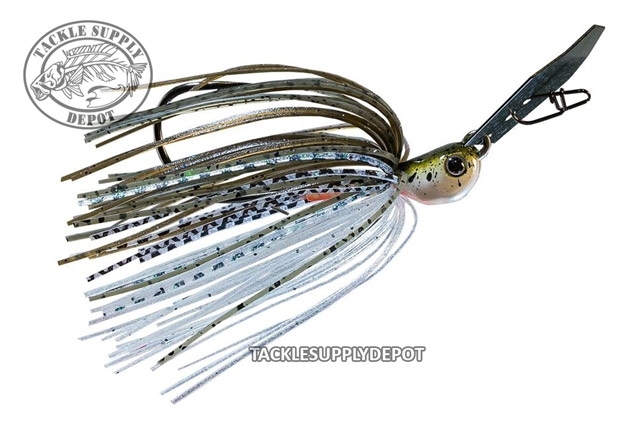 You're able to fish this bladed jig in grass where others falter. I pair it with a strike king blade minnow or yamamoto zako.